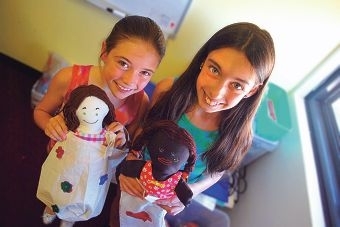 Chloe and Lili Walker with some of the Communicare dolls donated to Joondalup Health Campus recently. Communicare chief executive Martine Pitt said participants in a community initiative project developed practical skills that could create pathways to employment, while children could find comfort in the dolls, which were donated to Joondalup Health Campus (JHC). ‘The jobseekers working on this project have experienced long-term unemployment,’ she said. Participants work on the dolls every Thursday and Friday, which Ms Pitt said encouraged punctuality and reliability. JHC clinical nurse manager of paediatrics Linda Harris said young patients and staff members loved the dolls. ‘The dolls are given to children who are feeling unwell or are in pain (and) help to distract them from their discomfort and bring a smile to their faces,’ she said. Jobseekers with Communicare community initiatives work experience area are now involved in the SEWN UP project, where participants will make baby gowns and incubator covers. For more information, visit www.communicare.org.au or call 9251 5777.